BJP, one of India’s leading political parties, has been known for its readiness to experiment with different advertisement mediums to sway the public opinion in its favor. Its ‘India Shining’ and ‘Feel Good’ advertisement campaigns are a part of India’s advertising folklore. While these television ad campaigns weren’t very successful, Gujarat’s Chief Minister Narendra Modi‘s successful Google Hangout is a good example of how celebrities, politicians and corporations are leveraging social media to find favor with large communities of netizens. The use of Internet as a medium for promoting political ideas and connecting to the voters has been around since a long time. While political leaders in US, UK and Europe have been using the power of social media and Internet to build a loyal voter base since a long time, the trend is also catching up in rest of the world. For this particular case, some of the social media marketing elements played a big part on making Narendra Modi’s Google+ hangout on YouTube successful. The information about the hangout was available on Narendra Modi’s website since a long time, his Twitter followers were given updates on when the hangout would commence, and his fans were encouraged to watch it live on YouTube. One of the best ways to popularizing an upcoming an event is creating a buzz about it online. Twitter was abuzz with the excited news regarding the hangout 5-6 hours before the beginning of the actual event. Although the hangout was delayed by more than an hour, the YouTube servers for Narendra Modi’s page crashed owing to the large number of people who participated in the online event! By including Ajay Devgn (a Bollywood Actor) in his Google+ hangout, he ensured that his online event would benefit from the presence of the film star’s fans also. As a consequence of all the social media marketing, six of the trending topics in Twitter were related to Narendra Modi. 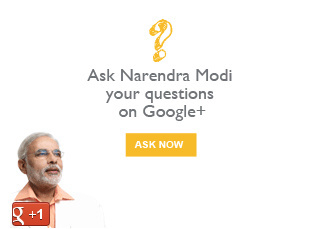 The success of Narendra Modi’s Google+ hangout on YouTube highlights the importance of social media in building a brand image and promoting a brand. Just as Gujarat’s Chief Minister has used social media to create an image of strength and accessibility, corporate houses and entrepreneurs can also build a loyal customer base through a judicious and well researched uses of various social media.